A major part in Further Mathematics is determining different physical characteristics of various shapes and sizes. This is an important skill needed for all questions throughout the exam as the application of maths starts with basic surface area calculations or volume calculations. Some of the following formulae are provided by VCAA during the examination but being already familiarised with each shape and formula saves vital time during the exam. Sometimes a combination of formulas and techniques are required to determine the volume or surface area of complex shapes. Find the volume of the following shape. 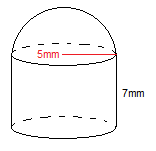 The radius is 5mm.